Despite the government shutdown the U.S. added 204,000 new jobs in October, and revised previous months upward. Added to robust GDP it suggests congressional dysfunction is becoming increasingly irrelevant to growth, and justifies reining in both fiscal and monetary stimuli. The U.S. economy added 204,000 jobs in October, according to delayed data from the Bureau of Labor Statistics, but the unemployment rate rose by 0.1 percentage point to 7.3 percent. However, while furloughed government employees were counted as “employed” in the establishment survey which counts job gains, many were counted as “unemployed” in the household survey from which the unemployment rate is calculated. 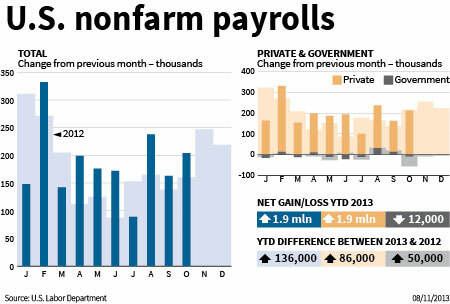 Previous months’ data were revised upward by 60,000 employment gains. Employment in leisure and hospitality rose by 53,000; in retail trade by 44,000; in professional and technical services by 21,000; in manufacturing by 18,000 and in healthcare by 15,000. Government employment declined by 8,000.